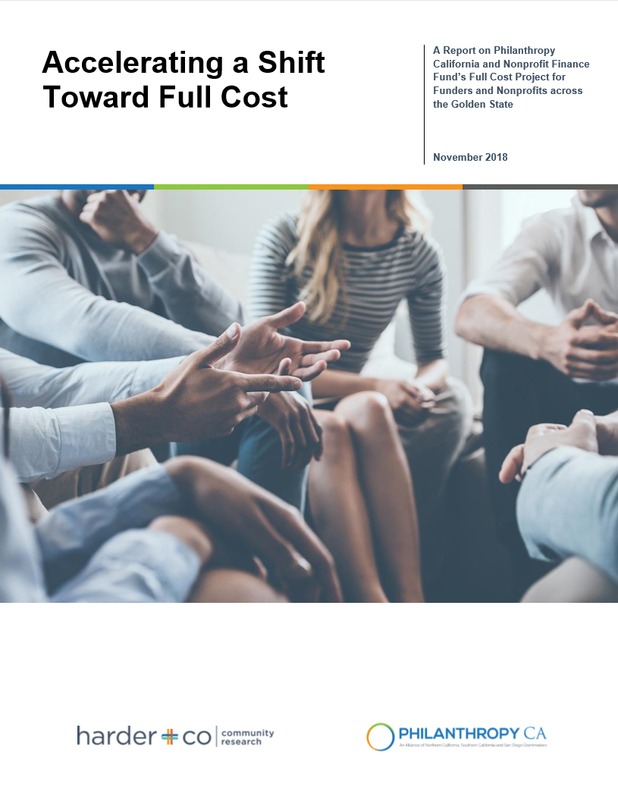 This final report is intended to highlight the ways the Full Cost Project impacted participants’ knowledge, practice, and overall understanding about the value of a full cost approach. 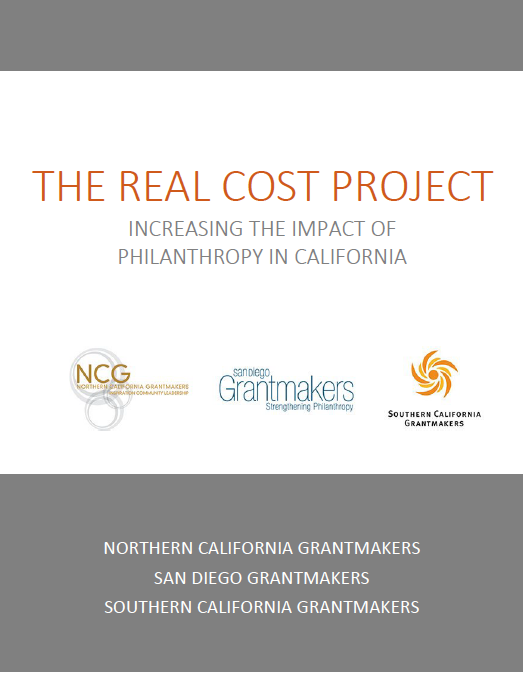 These findings will help inform Philanthropy California and key partners’ efforts in supporting nonprofits, funders, donors, and trustees adopt/adapt a full cost approach. This report synthesizes key data gathered from surveys and interviews with training participants and is organized in the following way: 1) understanding the value of the full cost approach 2) applying the full cost approach, 3) recommendations for adopting a full cost approach, and 4) conclusion. A key strategy in this initiative is to support skills building for nonprofit executives and funders to allow them to accurately account for full costs, clearly identify those costs, and discuss funding mechanisms that allow nonprofits to receive funding that takes those costs into account. 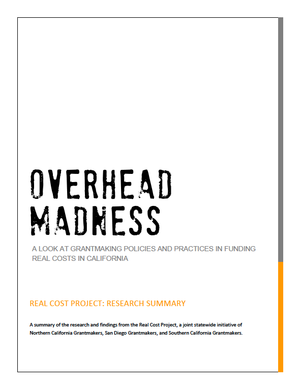 To implement this strategy, the Weingart Foundation, California Community Foundation and Nonprofit Finance Fund developed the Full Cost Funder/Grantee Pilot. 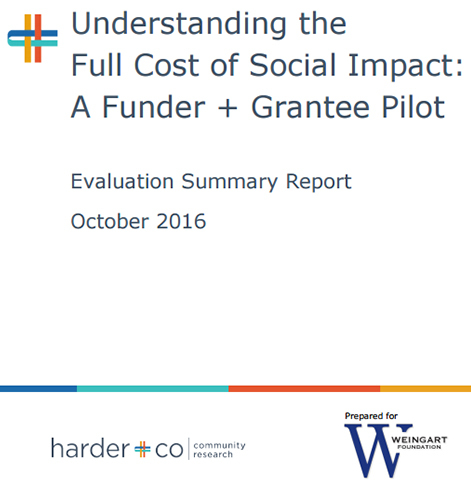 This report summarizes the findings of Harder+Company’s evaluation of the pilot and elevates considerations for the future implementation and scaling of this and similar initiatives. Around the country, as well as across the State of California, grantmakers are examining their funding practices and looking to develop new approaches to better support the communities they serve. Recently, numerous grantmakers have begun exploring what it would take to fund the real costs of the organizations they support – that is all of the necessary investments for a nonprofit organization to deliver on mission and to be sustainable over the long term. Building off of this interest, Northern California Grantmakers, San Diego Grantmakers and Southern California Grantmakers launched a joint statewide initiative – the Full Cost Project – to increase the impact of philanthropy across California. Representatives from more than 150 different foundations as well as government agencies and individual philanthropists participated in the Regional Forums help across the state of California to understand the barriers that were stopping grantmakers from adopting new practices. The resulting report, “Real Cost Project: Barriers to Change“, reveals common themes that surfaced from these forums and reflects the issues that participants viewed as the most relevant and urgent. Simultaneously, partners at California Association of Nonprofits held similar forums with nonprofit audiences around the state and a summary of these findings are included in the appendix. In June 2015, representatives from more than 150 different foundations as well as government agencies and individual philanthropists participated in the Regional Forums help across the state of California to understand the barriers that were stopping grantmakers from adopting new practices. 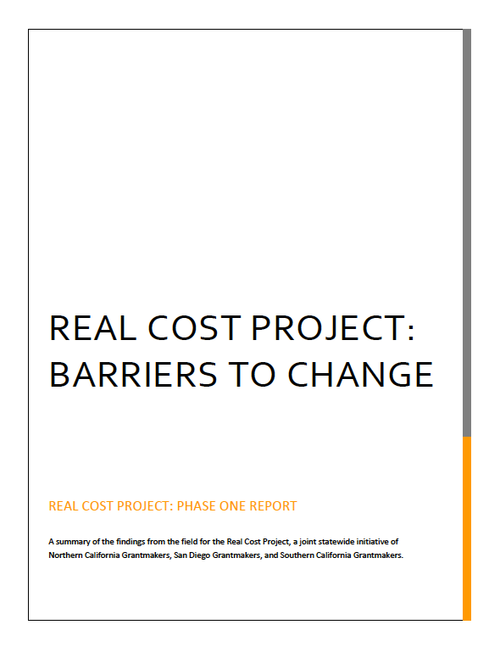 A new report, “Real Cost Project: Barriers to Change“, reveals common themes that surfaced from these forums and reflects the issues that participants viewed as the most relevant and urgent. Simultaneously, partners at California Association of Nonprofits held similar forums with nonprofit audiences around the state and a summary of these findings are included in the appendix.